A delegate allows a programmer to abstract functions as variable values in the same way that he abstracts other data, such as integers and doubles, as variable values. Simply put, a delegate is a variable type that defines a specific type of function. An instance of the delegate can hold a reference to any function of that type. The essential steps for using a delegate are listed above and demonstrated in the program below. The program consists of two files: Program.cs and CMyDelegateTester.cs–the additional class file is only needed for the second example. For the first example, we can layout the steps very easily. First, we have the delegate declaration just above the Main() function, which designates our delegate type, DDoSomething. Next, we have the instantiation, pfnFunction, of the delegate type right after the first comment inside the Main() function. This instance is assigned to the static Square() function in the same line. Finally, we call the Square() function via the delegate in the next line with the value 3.0 and output the result. In the second example, we do the same thing with an instance function of the CMyDelegateTester class. Notice that we need to instantiate the class and that we assign the function, along with its object, to the delegate. This is important because the delegate is attached to and will depend on the object in this case. C# delegates require the creation of a new data type. In fact, a delegate declaration is equivalent to a C++ typedef declaration of a function pointer type. While C++ does not require a new type definition to use function pointers, it is good practice. Like C++ function pointers, C# delegate types are detemined by the arguments and the return value. However, C++ distinguishes between static and instance functions and does not allow them to be used interchangeably as C# does. 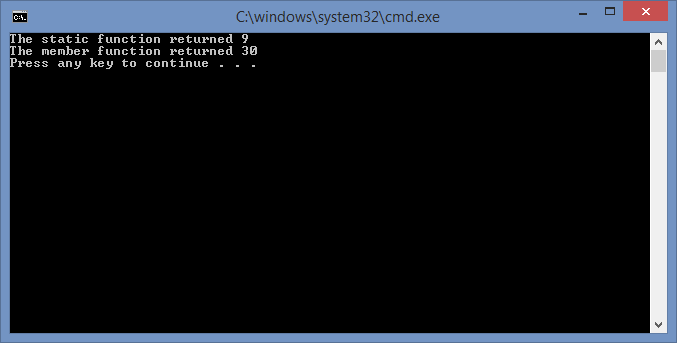 This is demonstrated in the C# code above. A C# delegate with a return type of void may be multicast to call multiple functions with one call. This is odd, but it is used with events and listeners, and will be illustrated in a future C# post.